Homemade Basic Muffin Recipe has a soft and tender crumb and is so quick and easy to make. This easy muffin recipe has so many variations that it will quickly become your family favorite muffin too! 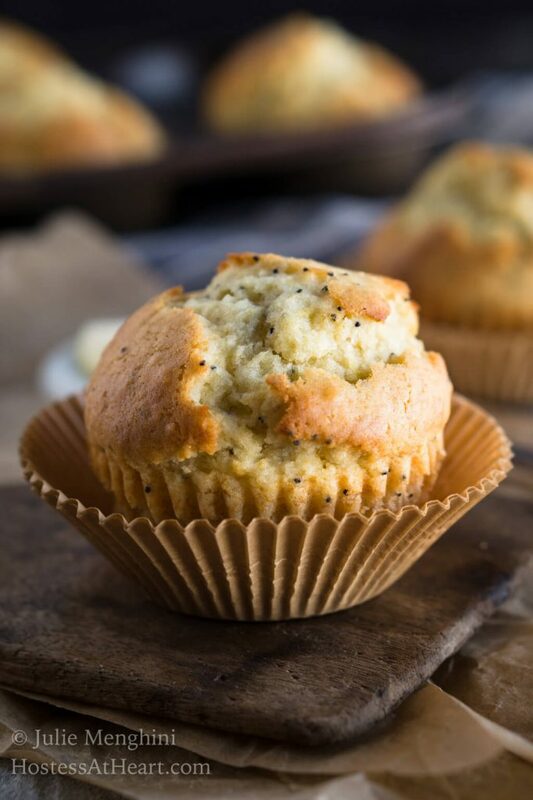 Our family favorite muffin recipe always makes our meal feel special. This Basic Muffin is soft and tender and can be flavored according to your tastes so everyone in your family thinks so too. You may want to double it so there are a few left for breakfast tomorrow. 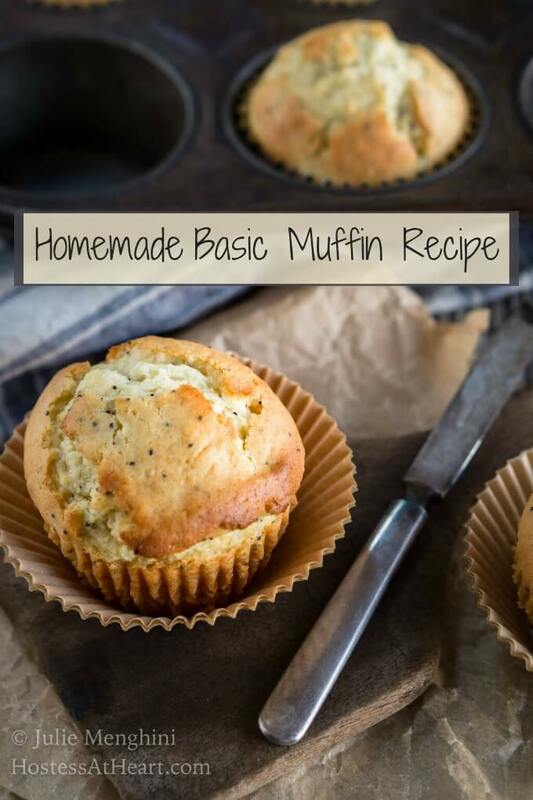 My family has always loved muffins and any time that I thought that I just needed to add something special to a simple meal it always came down to this Basic Muffin Recipe. The photos featured here are my Lemon Poppy Seed version. Even after working all day, if I had some soup on the stove I could whip up this Basic Muffin in a jiffy. They took the soup to a whole new level. 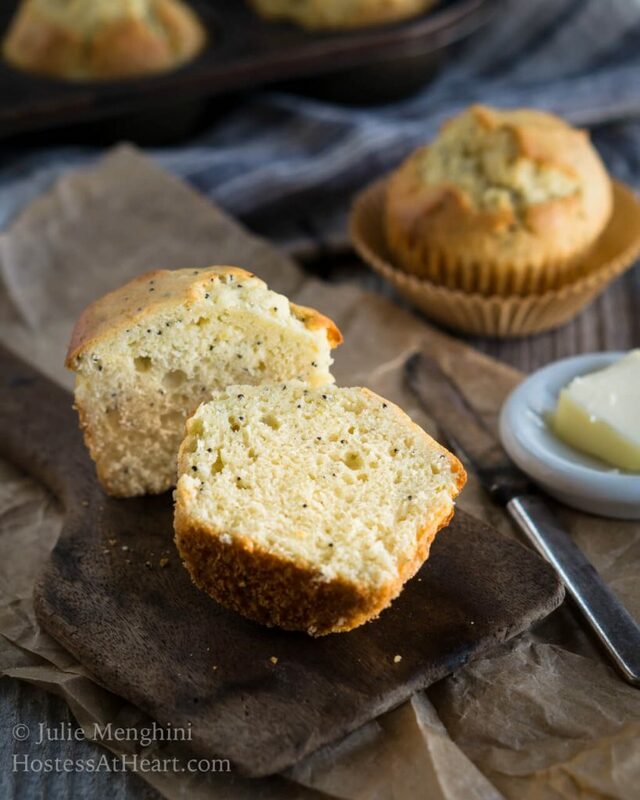 Lemon Poppy Seed – Exchange vanilla extract for 1 teaspoon of lemon extract and add 1 teaspoon of poppy seeds. Snickerdoodle – Add 1 teaspoon of cinnamon and sprinkle turbinado sugar over the top before baking. Lemon Blueberry – Exchange vanilla extract for 1 teaspoon of lemon extract and add 1/2 cup of fresh or frozen blueberries. Almond – Exchange vanilla extract for 1 teaspoon of almond extract and top with shaved almonds. Morning Glory – Add 1 teaspoon of cinnamon, 1/4 cup raisins, and 1/4 cup of walnuts. Sprinkle oats over the top if desired. Cinnamon Raisin – Add 1 teaspoon cinnamon and 1/3 cup raisins. Apple Pie – Add 1 teaspoon cinnamon and 1/2 cup chopped apples. Sprinkle top with turbinado sugar. As you can see, these homemade muffins have so many options and they bake up so quickly. It makes the perfect recipe to introduce baking to the kiddos too. In no time at all, they can dig into their works of muffin art! My favorite is the Basic Muffin recipe, hot from the oven and drizzled with honey. I’m salivating just thinking about them! 12 cup Muffin Pan – I love these muffin pans and have three of them so I can get them all filled and baked at once. They’re great for egg cups too! Baking racks – I love these racks because nothing will slip through the grid and they fit inside my jelly roll pan so I don’t need to flip what I’m baking on them. A great Homemade Basic Muffin Recipe makes any meal special. This recipe is quick and easy and you can flavor them any way you want. Preheat the oven to 400°F. Line a muffin pan with muffin papers or grease the pan well. Combine Egg, Milk and salad oil. In a separate bowl combine baking powder, flour, sugar, and salt. Whisk to combine. Pour the liquid ingredients into the dry ingredients. Blend only until combined. Spoon batter into each muffin paper until 2/3 full. Bake for 16-20 minutes. As you can see, there’s nothing basic about this basic muffin recipe. It’s just waiting to be reinvented in your kitchen! These quick and easy muffins also make a yummy breakfast treat the next morning, Just store them in an airtight bag or container if you have any leftover! Can you think of a couple muffin varieties that you would put on your table? I’d love it if you shared in the comments below! Thank you so much Mimmie! Intrigues by this simple recipe I gave it a try and something went wrong. I followed all the steps, as they are very simple, but baking them on 400 for 20 minutes resulted in white uncooked product. I left them in for another 5 minutes and another 5 minutes. They turned slight golden. There were no typical muffin cracks on top. They also came out rather chewy and hard to peel from the paper. Suggestions? Hi, Serge thank you for reaching out. Did you use Baking Powder? I’ve had readers make this mistake because it’s a bit unusual. I’ve never had any difficulty as you describe. I sure did. 2 teaspoons. I baked mine in the silicone baking form, not aluminum, not sure if that makes any difference. I’m just not sure Serge. Have you had any difficulty with your oven baking any other recipes? I am already on my second batch. Well, I should mention, the first batch was a mistake on my part. I been making cookies and other baked goods that use baking soda, so I subconsciously used baking soda instead of baking powder in the recipe. Oops! They looked good nonetheless. This new batch is still baking, but I’m sure it will be good. Thanks for sharing this simple recipe. Thank you for making my day with your sweet comments. This is definitely my go-to recipe when we want something just a bit sweet for dinner. How did the new batch come out? I just did the same! ! I hope you’ll try them again Marie and let me know what you think. I would think that could work Wanda. I often replace oil with applesauce. If you give it a try let me know how it goes. Thank you so much, Lisa! These muffins are so easy to make. Give them a try and let me know if you have any questions. I’d love to know if you make the plan version or mix up your own version. Hmmm Gareth the only thing I can think of is that you may want to either reduce the cooking time or the temp on your oven by 25 degrees. These muffins shouldn’t come out with a hard exterior. oops! Give them another try and let me know what you think! Thanks for letting me know and so glad you’ve isolated the issue. Have an amazing day! I love muffin too, they are both cute and delicious. Thank for your recipe, I made the blueberry muffin yesterday and its taste was amazing! Thank you so much for letting me know! These muffins are what I make most often with a good cup of soup. This recipe was great!! Its really hard to find plain muffins to buy, so this is amazing!! I’m not huge into a lot of sweets, so this is perfect for me & simple enough to make anytime without alot of effort!! Thank you, Davion! I’m so glad that you stopped by and let me know that you enjoyed this recipe. It really made my day! These are really great. I know you said any milk will do. I live in the Caribbean and fresh coconuts are readily available so I make my own coconut milk. Do you think homemade coconut milk would work in this recipie? Lucky you, Lisa! I know coconut milk will work wonderfully and give this muffin an amazing flavor. Hi. So update. I just made this using homemade coconut milk and I put the fresh coconut fruit in for texture and look. I baked it into a loaf pan ( I could not find my muffin tins) . Came out great. The only thing I would change with fresh coconuts, is that I would use less sugar. Love love this !!!!!! Thank you Lisa! I’m so happy that you stopped by to let me know that this worked out for you. I am sure that the coconut milk and fruit worked and was delicious! Thank you Tasha! I hope you’ll let me know how they come out and what version you made. If i wanted to make blueberry muffins, would I follow the recipe as is and just add blueberries? That’s correct Jasmine! I do it all the time. 12 cup per batch works great and a lemon extract instead of vanilla is yummy too. Thanks for stopping! Can you replace some of the flour with cocoa powder to make chocolate muffins? What would you recommend? Hi Shawn. How much cocoa powder are you thinking of adding? If it’s a tablespoon I would just replace the flour. If it’s more than that I would add the cocoa in addition to the flour and add an additional teaspoon of oil or even applesauce so the muffin isn’t dry. Let me know how your muffin comes out. Thank you for contacting me. I love how versatile this recipe is! Muffins are one of my favorite things to bake! Thank you Madi! I love muffins too. I think I’ve probably baked this recipe more than any other. I love that this is a basic and how you can make it to a different kind! It would be fun for a Sunday thing, make the batter and everyone makes own kind they want! Thank you, Deanna! It is certainly one of our favorites too! These are the best kinds of recipes — easily changed up to match your mood and always delicious!! Thanks for sharing! Thank you, Michaela! I agree! This is so great to have!!! A good muffin base is essential and then putting different varieties in there is just so much fun! Love this! I love having a basic recipe that just needs a few additives to make a whole new muffin! I love the idea of a plain muffin with soups. My family usually does cornbread but I am looking forward to trying these! Thank you, Jennifer! We just love this one. Quick easy and yummy! How delicious, what a lovely recipe! It’s amazing how versatile this is – certainly a flavor for everyone! Breakfast is served!!! I love the convenience of these muffins – just grab and go. And, they are so delicious! Thanks for the great recipe. Thanks, Debi! They are so yummy and I love having an extra one for my morning breakfast! These were so easy! We ate all of them at my coffee club and really enjoyed them! Thank you so much, Michele! You are one busy girlie. Thank you for trying them and so happy you enjoyed them. These muffins look so delicious! It’s great to have a basic recipe that you can change up into so many different flavors! Thank you Lisa! We really enjoy them. Great recipe! I love that they are so versatile! Thank you, Karly! This recipe is definitely my go too for a quick special addition to a meal. I am in love with this recipe Julie. So amazing that it’s so simple and easy. Loved how you have given so many other flavor combinations. I am going to use this recipe to create Eggfree version. Will link back to yours and am sharing it on my FB Blog Page. Thank you so much Sonal! This is a simple recipe but it’s one of my most special. I’ve been using it forever and hope you will enjoy it as much as we have! Hugs my friend! We used to have “plain” muffins, with soups or casseroles sometimes, and for breakfast, too. I haven’t heard of that for awhile. Maybe it was more popular before ppl went all low fat and then low carb.Yours look beautiful, Julie! Thank you so much! I love muffins with savory dishes but am no snob. I’d snarf one by itself too! Thank you Judi! This is such a simple recipe but it’s about the only one I use consistency. I tend to either just use the basic or Lemon!